Authorities say the death toll from the dam breach at a Brazilian iron ore complex has increased to 84 from 65. Lt. Flavio Godinho of the Minas Gerais state civil defense agency also says the number of missing stood Tuesday night at 276. 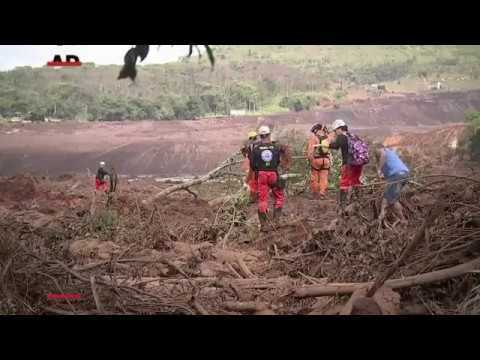 Searchers are still looking for survivors or bodies in the muck that poured out of the dam last Friday in the small city of Brumadinho, inundating buildings owned by big mining company Vale SA and nearby neighborhoods. Grieving members of victims were burying some of the dead on Tuesday and there was mounting anger directed at Vale, the world’s largest miner of iron ore. The ore is the raw ingredient for making steel. Possible ecological damage from a Brazilian iron ore mine dam that burst last week and killed at least 65 people is visible in an indigenous community about 18 kilometers (11 miles) downstream from the dam. The normally greenish Paraopeba River was dark brown on Tuesday after mud flowed out of the dam last Friday. Dead fish, garbage and refuse like plastic sandals were seen floating on its banks by an Associated Press reporting team. Pataxco Indians living there say they had been told by Brazilian environmental workers not to fish, take baths in the river or use river water to water the plants they cultivate for food. Village chief Hayo says: “Now we can’t do any of that.” He goes by one name. Two Brazilian Institute of Environment and Renewable Natural Resources officials were taking water samples and talking to members of the tribe. The agents said they did not have authorization to speak with the AP team. Authorities say five workers involved with a Brazilian dam that breached and killed at least 65 people will be detained for 30 days while officials investigate suspicions of criminal responsibility. Federal police from the southeastern state of Minas Gerais where the dam is located did not list possible charges in a statement and said that a judge will eventually decide whether the criminal case moves forward. Three of the workers are with Brazil’s Vale SA, the owner and operator of the dam and the largest global producer of iron ore, the raw ingredient in steel. Two work with Germany’s TUEV Sued company, which said in a statement that it had conducted inspections of the dam. The detentions came as the families of mining company workers killed by an inundation of mud and mining waste started to bury the victims. Authorities have said that 279 people are missing and that the death toll from the disaster will rise. At a cemetery in the small Brazilian city of Brumadinho, 15 freshly dug graves await the remains of some of those killed when a nearby iron ore mining dam breached and killed at least 65 people. Wailing in grief at the cemetery was the wife of Edgar Carvalho Santos, one of the mining company’s workers whose body has been found. Authorities on Tuesday arrested five people in their investigation of the dam’s collapse last Friday. Three work for the mining company, Vale SA. Two work for the German TUEV Sued company that had performed inspections of the dam. A German company involved in the inspection of the dam that collapsed in Brazil last week says two of its employees have been arrested in the country. Brazil’s Vale SA also says three of its employees were also arrested. The Munich-based TUEV Sued company declined to specify Tuesday whether the arrested staff were from its German headquarters or its Brazilian branch. Vale in a statement provided no details about the company workers who were arrested except to say that it is cooperating with the investigation into the iron ore mine tailings dam breach that killed at least 65 people and left nearly 300 missing. TUEV Sued said Monday that it had conducted a periodic review of dams for Brazilian mining company Vale SA in July 2018 and a regular inspection of dam safety in September last year. The collapse last Friday flooded parts of the small city of Brumadinho with reddish-brown mud and iron ore mining waste. Many more are still missing. Shares of Brazilian mining company Vale are making a muted comeback after they plunged following the collapse of an iron ore mine dam that killed at least 65 people. Vale SA’s American depository shares were up 3.5 percent Tuesday to $11.59 a share on the New York Stock Exchange. The company’s shares tanked nearly 18 percent on Monday, three days after the dam collapsed in the southeastern state of Minas Gerais. The breach sent rivers of mud inundating Vale company buildings and nearby neighborhoods in the small city of Brumadinho. Rescuers on Tuesday were spending a fifth day looking for survivors and bodies. Some families began burying dead relatives amid growing outrage directed at Vale. The company is the world’s largest producer of iron ore, the raw ingredient for steel. Brazilian authorities issued arrest warrants Tuesday for five people in connection with a dam collapse that killed at least 65 people as it plastered part of a city with reddish-brown mud and iron ore mining waste.